The planning, the strategy, the sacrifices and heroics - on both sides - illuminating the greatest naval war in history. On the first Sunday in December 1941, an armada of Japanese warplanes appeared suddenly over Pearl Harbor, Hawaii, and devastated the U.S. Pacific Fleet. Six months later, in a sea fight north of the tiny atoll of Midway, four Japanese aircraft carriers were sent into the abyss. 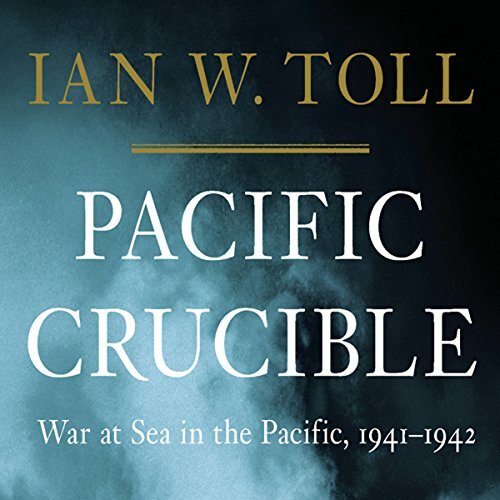 Pacific Crucible tells the epic tale of these first searing months of the Pacific war, when the U.S. Navy shook off the worst defeat in American military history and seized the strategic initiative. Ian W. Toll's dramatic narrative encompasses both the high command and the "sailor's-eye" view from the lower deck. Relying predominantly on eyewitness accounts and primary sources, Pacific Crucible also spotlights recent scholarship that has revised our understanding of the conflict, including the Japanese decision to provoke a war that few in the country's highest circles thought they could win. The result is a pause-resistant history that does justice to the breadth and depth of a tremendous subject. ©2011 Ian W. Toll (P)2011 Audible, Inc. I have been reading about World War II for many years, but most of the books I have read cover the war in the European area – North Africa, Sicily, Italy, France, Poland and Russia. 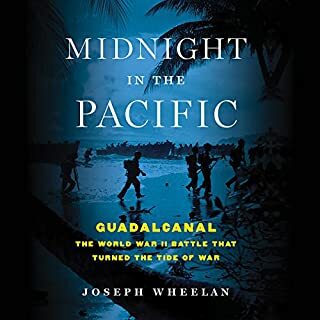 While I have read some books about the war in the Pacific (Stillwell and the American Experience in China, John Keegan’s World War II, Mitsuo Fuchitda’s Midway and some others) none have given a really good view of the war in the entire Pacific area. I bought this book thinking it might fill in some big holes in my knowledge and I was not disappointed. While the book is concerned mainly about the first year or so of the Pacific war it actually begins with the history of the lead up to War War II starting with the period of the Russo-Japanese war and discusses, in some detail, the political movements in Japan during the period of 1920 through 1941. It provides a great deal of background by discussing events from both the American and Japanese view points and is very helpful in explaining how the Japanese military gained control over the civilian governments during this period and thus paved the way for the war with the US. Indeed one of the things that sets this book apart from others that I have read is that it provides an enormous amount of insight into what the Japanese thinking was both prior to and during the war and there is a great deal of information about things I never knew – the conflict between Japan’s Battleship and Aircraft Carrier officers, the strenuous efforts made by the Treaty Admirals in Japan to prevent war with the US, the reason for some of Japan’s tactical decisions during the conflict and the story (in detail) about the American breaking of some of the Japanese codes. While I thought I knew about the code breaking effort I realized, from this book, how little I knew of how it was done and what happened to the code breaking unit (and to Lt Cmdr Joseph Rochefort) before and after the battle. In addition the book is read by Grover Gardner who does a masterful job of narration. The book is so interesting and so well read that I found myself reluctant to stop listening. This book is, in my estimate, one of the finest books covering the war that I have read. My only real complaint is that it covers the war only up to the Battle of Midway and I would buy any sequel covering the rest of the war in a heartbeat if it was available. 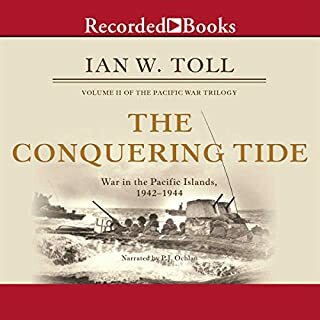 I highly recommend this book if you have any interest in either the history leading up to the start of World War II in the Pacific or the events during the first year of the war. I thought Tull's "Six Frigates" was just of average interest, but "Pacific Crucible" is leaps and bounds beyond that. It's just the kind of narrative history I love: the writer is willing to take time to explore the background and side stories at length without losing the momentum of the story. Tull takes the time to show how the American and Japanese navies came to be shaped and then demonstrates throughout his account of the clashes, beginning with Pearl Harbor and ending with Midway, between them. Like Max Hastings, Tull is adept at interweaving personal accounts with the larger historical view. To me, the ultimate test of an audiobook is whether I'm tempted away to listen to other things: in this case, I was held for over twenty hours without ever once experiencing that temptation. A terrific listen! This book is a marvelous read and the narrator presents well. 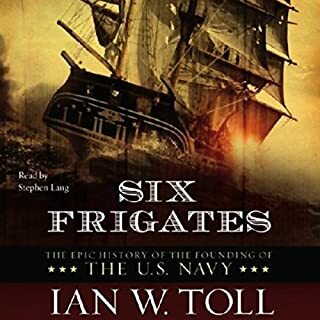 This is the second book I've listened to by Toll, the first being Six Frigates. Both have been a pleasure to listen to.This is a narrative version of the history of events in the Pacific theater from Tsushima in '05 to Midway in '42. The story addresses the increase in Japan's Pacific influence, the reasons for the decisions made by Japan and other major countries to move as they did. Major events like Pearl Harbor and the battle of the Coral Sea are covered in fine detail. Many major players are described in detail as well: Nimitz, Yamamoto, Emperor Hirohito, Roosevelt, King, Rochefort, et al. Toll also presents their motivations for consideration insofar as history allows. All-in-all this is a very well presented story of an important part of the tumultuous first half of the 20th century. Two thumbs way up.Some have complained in these comments about the abrupt ending after Midway. I found the author did a good job of finishing the description of that momentous battle and wrapping up the work. Yet there was much that occurred in the Pacific theater over the next 3 years of the 2nd World War. Maybe Toll is working on his sequel? Pacific Crucible is a wonderful blend of history and personal accounts. Although the book is obviously factual, it provides the types of interesting details into certain people's lives that made it feel like a story. Do realize, however, that the book details Pearl Harbor through Midway Island only, and does not go further into the Pacific conflict. That should not stop you though. The book provides great detail into the main battles, and main commanders of the Pacific front during this time of the war. I have listened to quite a few books on this period, and have quickly become a fan of Toll and his works. I highly recommend this book. Excellent narrative history and superb narration. Would you consider the audio edition of Pacific Crucible to be better than the print version? I only have the audio edition. What was one of the most memorable moments of Pacific Crucible? Toll goes into detail on the initial carrier raids of the Marshall Islands. This chapter of the conflict is little known and Toll not only explains the motivations behind the attacks but also how the attacks affected the Japanese High Command. They were all equally good as Gardner sticks to narrating the story instead of trying to guess how a particular character would have sounded. Yes. The dedication of the Pearl Harbor cryptanalyst went unnoticed by many at the time. The jealousy of stateside intelligence toward Captain Joseph Rochefort. Most of the cryptanalyst were working for days at a time without rest and only kept awake and alert by the liberal use of amphetamines and coffee. The book is excellent. Toll brings us up to the attack on Pearl Harbor with insightful history of the dealings between Japan and the US from the beginning of the century that give an understanding on how and why such an event took place. Toll then gives a brief description of the already well known attack on Pearl Harbor and then goes into detail of the events and battles which led up to and including Midway. What makes the narrative even better is Grover Gardner. I first listened to Gardner in Shelby Foote's massive The Civil War and never grew tired of his narrative. The same can be said of Gardner's performance with this book. He doesn't try to add accents and the reading is smooth and intelligible throughout. I have read and watched so many books and docs on war that I doubted I could ever find another title that would really engage me. Needless to say this one did. Firstly the writing is swift, clever and of an unusually high caliber and the narration is excellent and fits the material very well .Secondly the author has done his research extremely well and it really comes through with fascinating wide strokes and highly personal and detailed insights from BOTH sides. I found the insights into the Japanese side utterly fascinating and all new (at least for me).. While I had read numerous accounts of pearl harbor and midway I felt it all new and utterly fascinating through tolls superlative insight of both sides told with his remarkably engaging story telling style. I use REMARKABLE, FACINATING and ENGAGING quite a lot when reflecting on this book and those three words really sum it all up. HIGHLY RECOMENDED. I thought this was a fantastic study of Nimitz & other players in the Pacific War. I've read quite a lot of WW2 books and this would be among the books that I'd recommend. The author gives superb details, yet not to the point of overloading the reader (listener.) If you enjoyed "The Pacific" miniseries and want to learn more, this is the book to start with. Grover Gardener is as always, melodic, and his style flows along smoothly. I didn't speed this book up at all during the listen, and I've only done that for one other book..."Unbroken." You will enjoy this book...I promise. What did you love best about Pacific Crucible? I downloaded it because it had Grover Gardener as the narrator & it was a WWII history book – two of my favorite things! Turns out it was so engrossing, it was very hard to put down and hit the pause button. It gave some great new insight into the period from Pearl Harbor to Midway, and I was pretty bummed out when it ended. The background given to each of the Admirals (King, Nimitz, and the others) really brings them to life. In addition, I found the narrative he weaves of the events leading up the Midway and the days of the battle very well done. As usual, Gardener does an extraordinary job of making you feel like he is sitting right there, bringing a story to life and illuminating the text for you. It's very hard to listen to an audiobook by any other narrator once you've just finished a Gardener book. WWII histories are among my favorites, but this one really brought everything to life in a way that not many actually do. Ian Toll does superb work with this history. The story of the U.S. Navy in the Pacific from Pearl Harbor to Midway is remarkable. These six months may be the Navy's best. Toll expertly weaves in back story and context, just when you want it. Toll's analysis of the facts struck me as completely authentic. And Grover Gardner does his consistently great narration on this book as well. Toll's research is impressive and he writes superbly. 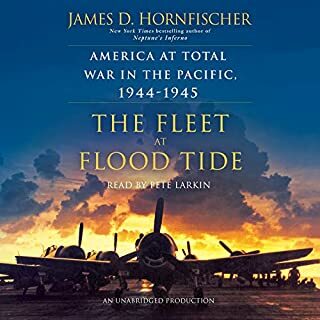 What's more, Grover Gardner delivers the book with his usual precise craft, and I could happily have listened for far more than the 22 hours it took to take us from the approaches to Pearl Harbor to the immediate aftermath of the Battle of Midway. 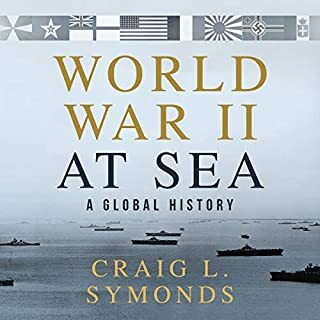 In fact, I wanted to since I was somewhat disappointed to find that, while the title promises "1941-1942," the account actually only covers the first six months of the Pacific naval war. Thus it wraps up months before the vital actions surrounding the holding of Guadalcanal. I would gladly have exchanged the prolonged biographical material on political and military leaders on both sides of the conflict, for more detailed accounts of the naval struggles at the Santa Cruz Islands and Iron Bottom Sound. Still, it is probably churlish to complain that a terrific writer has not aligned his focus with your particular predilections. 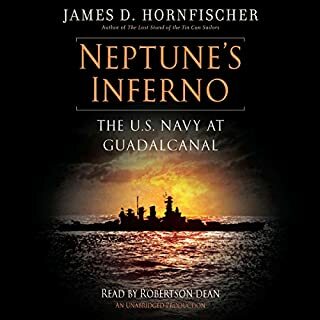 This is a very well written piece of history, and anyone interested in the rest of 1942 will find an extremely fine account in "Neptune's Inferno" by James D. Hornfischer.